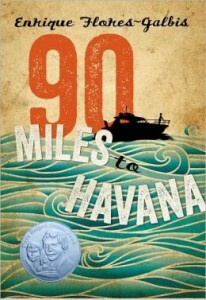 This great novel by Enrique Flores-Galbis, is the story about a family living in Cuba and being forced to move to America during the Revolution.The characters in the book were very realistic.The kids had different personalities. Julian was the easiest to understand because he and I both enjoy art and drawing. He was the youngest and his brothers did not treat him as though he could do many, even though he was capable. In one part of the story, the older boys were going to sneak into a boarded up house but told Julian to stay outside because they thought he was too little to go inside with them. The thrilling excitement and emotion that goes on in the story is so immense.With the lives of fourteen people hanging in the balance of the boat ride. The lifelike characters were so descriptive and realistic that I could see the emotion in their faces at all time and I could almost tell what they were thinking. The ending is a little predictable but had a twist that was a little shocking but the story still could of had a more dramatic ending.I would recommend 90 Miles to Havana to people that have been sent away from their homes or whose families have been treated poorly. Since these characters endured similar experiences, these people would enjoy this exciting journey.